I was was a not so good morning and now my head it too big. I love all the comments and compliments. Thank you that made my day better. Lately I feel like my friends are judging me. Today my friend watched Priyasha while I went to school. I was comfortable with that like I always am. Today she called to tell me that Priyasha was upset and asked if she could give her a lollipop. I appreciated that she asked but I was annoyed that she even asked. Why is it that candy is supposed to make it all better. That is not how I parent. Not that it is a bad thing but there are other solutions. So here is what the deal is. About six months ago that same friend gave Priyasha a lollipop right before I picked her up and she was very proud that she did that. My reaction as I walked up to the car was " Did you give my daughter a lollipop ?" She said " yes" with a grin . I was not happy so I yanked , yes yanked that sugar and chucked it across the parking lot as far as I could throw. Dramatic ? Yes. I caught my friend off guard and things got weird. I then left and when I cooled down I called and apologized. I explained that Priyasha could not have a lollipop as Pravan did not get one until he was four. My kids are prone to being diabetic and I have to control the sugar they eat. They almost never get candy or cookies but they get enough to be normal. I as a mother should have the right to restrict whatever I choose and that should be respected by others. Okay the first time she really had no idea and it was innocent. Today she knew very well. I really should not be upset as she asked first and respected my wishes. What hurt was when she said " Ah man , I thought you would give in as she is upset " Okay that just made me feel like a bad mom and made me feel awful. When I picked my daughter up I got her a fruit smoothie so I could feel better. It was a better choice but the point is one should never have to feel bad about the way they parent. Even I need guidance at times but I will not give in to candy even if she was the fourth kid. On the note of needing guidance myself. Age six and school has brought new challenges to my parenting skills. There are many things I hope my children never know and one would be that I am not a fan of reading. I am simply too busy to sit still for more than five min at a time. I remember reading somewhere that kids model after you and if they see you curled up with a book then they will more than likely grow up loving to read. My mother never went to school and as a result cannot read or write. I grew up not liking to read either. Well it is time to break that cycle and I am willing to finally learn the joys of books. 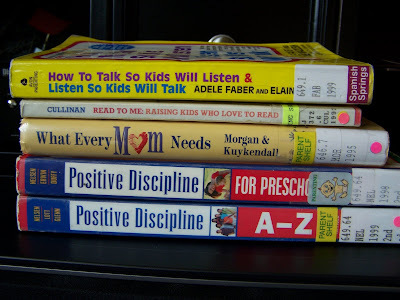 Here are all the books i checked out as I am have been doubting myself as a mother. I hope this helps. I cannot tolerate the sibling bickering and tattling. Someone tell me how it will stop. Ia m tired of yelling and sending them to their rooms. I hope to fine a solution in these books. aww! I am sorry to hear/read that you are having a hard time. I just thought I would tell you that there are a few blogs from the photochallenge that I follow (you know not just checking out their pictures)and yours is one. I think you are a fantastic mom,and it sounds like your home is filled with love and thats the best thing you can do for your kiddos.